What is the most important part of your hygiene routine at the top of each day? Some would say it’s washing your face, some would say it’s taking a shower, and some would even say it’s checking your social media or emails LOL. But the truth is the most important step for hygiene at the top of the day for me at least is brushing my teeth. If you go the entire day and you don’t brush your teeth, you don’t clean your tongue, or you don’t gargle your mouthwash you’re bound to run into a few problems, well a major problem. That problem being bad breath and let’s be honest who wants bad breath? You can walk into a room full of people without a stitch of makeup, no nails did, if you’re a guy maybe you look a bit more rugged because you haven’t shaved but you may just get a pass if your breath at least smells good and your pearly whites are gleaming. I pride myself in aligning my brand with brands that I can really stand behind. 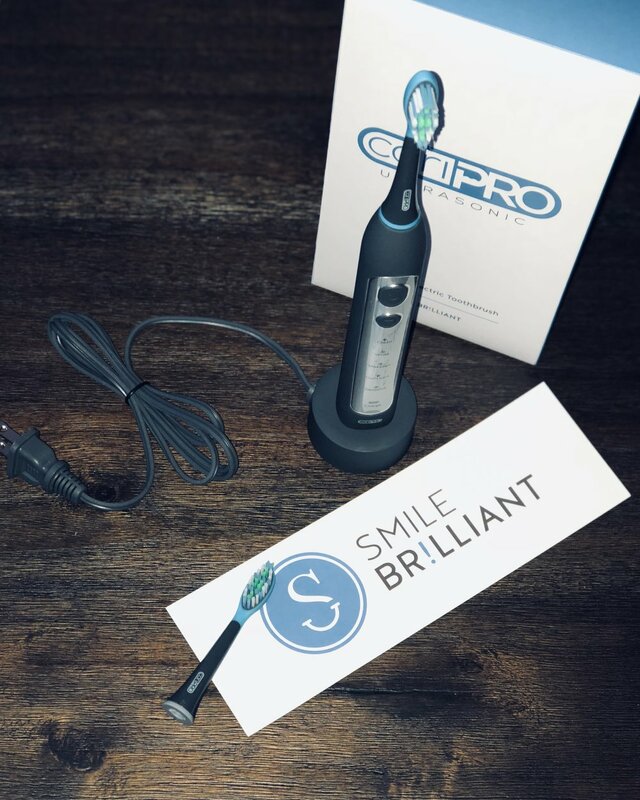 So when I was contacted by Smile Brilliant to try their newest release, the cariPro Ultrasonic Electric Toothbrush it was a no-brainer. Since it’s the holidays I regrettably find myself indulging in things that may not be as good for my teeth like the sweet potato pecan pie I made for Thanksgiving or the hot chocolate I had afterward so it’s really important that I’m able to practice good hygiene not only for myself but to show my son (who is extremely young and impressionable) what it looks like and that is where the cariPro Ultrasonic Electric Toothbrush comes into play. Now, I have to be honest with you. I’ve been using a manual toothbrush since forever to brush my teeth. I think I’ve owned an electric toothbrush once before and I can’t even remember what brand it was but obviously, it wasn’t good enough for me to continue using it so I switched back over to manual. I thought I was doing a pretty good job at getting my teeth nice and clean, but then my cariPro Ultrasonic Electric Toothbrush arrived and voila! The term “clean” began to have a whole new meaning. Electric toothbrushes are great because they effectively remove more plaque and decrease gingivitis than their manual counterparts thanks to their vibrating/rotating bristles that allow micro-movements when moving the toothbrush across the teeth. Electric toothbrushes are easier for people with limited mobility and range, they also help cut down on waste because instead of replacing an entire toothbrush every three to four months you only have to replace the head. One study shows that brushing with an electric toothbrush increased mental clarity and focus while another showed that using an electric toothbrush is great for people with orthodontic appliances, maybe I should get my sister one LOL. 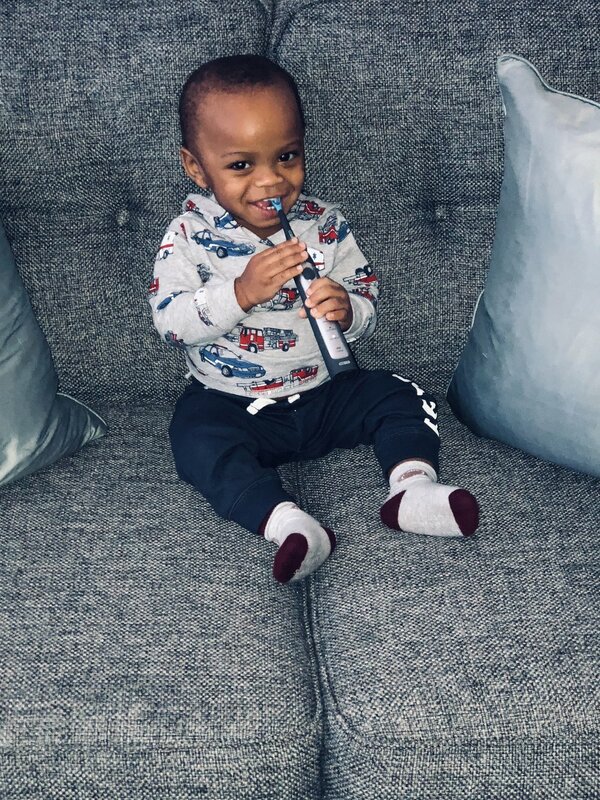 Electric toothbrushes are also great for kids because it is more stimulating and engaging which can help with good oral cleaning and establishing healthy habits. It also makes it easier to brush their teeth because they are tickled by the vibrations making it easier to get them to open up to get their teeth cleaned. Using an electric toothbrush is also safer for gums and your enamel which helps to promote overall oral health. Price: There are three different packages you can choose when you get ready to buy your brand new cariPro Ultrasonic Electric Toothbrush. The first is the couple’s package which is great because you and your significant other can both achieve great hygiene at the same time like couples do in movies when they wake up and brush their teeth together, or you can keep one and gift the other to whomever you choose. The duo cariPro Ultrasonic Electric Toothbrush package is valued at $440 however for the price of $199 you can bring home two cariPro Ultrasonic Electric Toothbrushes, four premium replacement heads with tongue scrapers and Dupont bristles, and two wireless charging docks. Let’s say you want to give someone a luxurious gift this Christmas, no problem, you can get the Deluxe cariPro Ultrasonic Electric Toothbrush package valued at $250 for only $129 which comes with one cariPro Ultrasonic Electric Toothbrush, four premium replacement heads with tongue scrapers and Dupont bristles, and one wireless charging dock. The final package, which is also the one I received is the individual package valued at $220, but for the price of $119 you can get one cariPro Ultrasonic Electric Toothbrush, two premium replacement heads with tongue scrapers, and Dupont bristles, and one wireless charging dock. If the price is something you are worried about, I’ll set your mind at ease, the cariPro Ultrasonic Electric Toothbrush is more than affordable! Some people spend $100 a month on various things that aren’t as serious as oral hygiene, myself included. Features: The features for the cariPro are amazing! With it’s Dupont bristles, 40k vibrations, the waterproof design which is safe to use in the shower or bath, built-in tongue scrapers, and five brush modes you will be well on your way to a cleaner healthier mouth! The cariPro also removes up to seven times more plaque than a manual toothbrush, it improves gum health in as little as two weeks, gives you two times whiter teeth in just one week, and is comfortable to hold thanks to its rubberized design. Cleaning Modes: The cariPro Ultrasonic Electric Toothbrush also has five cleaning modes to help you obtain a healthier mouth. Clean is the standard mode for superior daily cleaning and it really does a great job of leaving my teeth squeaky clean, kind of like when you have freshly mopped floors and you walk on them with your shoes and you hear the “squeak, squeak” sound. White is the most powerful cleaning modes, and it’s one of my favorites because it does a great job at removing surface stains, polishing, and vigorously deep cleaning. Massage is a gentle gum pulsation mode for gum stimulation which should be used in combination with another cleaning mode for complete coverage. Gum Care is another gum mode for gentle cleaning along the gum-line, and it should also be used with another cleaning mode for complete coverage. I like to pair it with the white mode to get my teeth nice and clean. Sensitive is great if any of the above-mentioned modes prove to be too much to handle you can use the sensitive mode for gentle cleaning which is just as good as the basic clean mode to achieve a brilliant smile. Sometimes my gums are a bit sensitive so I switch over to this mode and I still get that squeaky clean feeling that I love. Use Gentle Brush Strokes: I know sometimes we think harder means better, but trust me y’all, it doesn’t. So be gentle. Gentle brush strokes are way better for your gums, brushing too hard can damage your gum tissue and cause a receding gum-line. So remember to be gentle and massage your gums. Angle at 45 degrees: Placing your toothbrush at a 45-degree angle, look at geometry coming in handy, and brushing along the gum-line moving the brush inside to outside of each tooth to achieve full cleaning coverage makes all the difference. If you have a hard time doing that, just tilt your head a bit, that always does the trick. Brush all four corners: When you brush make sure you leave no tooth untouched. Each mode on the cariPro is meant to last for exactly two minutes, which ideally is how long you should brush your teeth anyway. Those two minutes are split into thirty-second burst, so at the end of every burst move your brushing to a different quadrant of the mouth. Brush Twice Daily: In order to keep your hygiene up to par, it’s important to brush your teeth twice a day, so morning & before bed. Maintain Your Enamel: Enamel is the visible part of your tooth. Wearing it down can result in tooth decay and increased sensitivity. In order to prevent enamel erosion, avoid using abrasive toothpaste, brushing too hard, and wait at least 30 minutes after eating and drinking to brush. Floss: In addition to brushing it’s important to also floss to help remove any food particles or decay-causing plaque. If string floss isn’t your thing stop by your drug store and get some flossing sticks. They are super cheap and easy to use. Use the Correct Toothpaste and Mouthwash: Use a non-abrasive toothpaste and an alcohol-free toothpaste and mouthwash because toothpaste and mouthwash containing alcohol can be toxic, drying to the mouth’s soft tissue, and can increase bacteria levels which can cause bad breath. Brush or Scrub Your Tongue: You can fight bad breath by adequately brushing your tongue with the brush head or by using the tongue scraper on the back of the brush head. It may be overkill, but I prefer to use both. I’m kind of OCD when it comes to brushing my teeth and cleaning my tongue. Regular Checkups with Your Dentist: Nothing beats regular visits with your dentist when it comes to hygiene. The tips listed above plus cleanings and checkups will help you maintain a long-term, healthier brighter smile. The most important hygiene tip I can give you is to place your order now for your brand new cariPro Ultrasonic Electric Toothbrush from Smile Brilliant! If you don’t, you’re going to wish you had. If you think the cariPro isn’t affordable, just remember what we talked about, it’s worth more than you are going to pay for it, most people spend just as much on miscellaneous items, and I have a coupon code for you! Invest in your health, and apply the hygiene tips given to you to help you Smile Brilliant! If you enjoyed this Beauty Blog make sure you subscribe for updates!